Cassandra joined the AMSI Choose Maths team in July 2017. Her journey to become a mathematics educator began soon after secondary school, where she completed a Bachelor’s degree in mathematics, specialising in statistics. Many years of being told by others that they “hated maths at school” would lead her to complete a teaching degree at the University of Melbourne, in the hope to shift students’ attitudes towards her beloved subject. 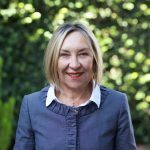 In 2012, with a renewed focus on leadership, she returned to the University of Melbourne to complete a Master of Education in which she focused on mathematics education. Cassandra has worked across the Government and Catholic sectors in various primary schools in the western suburbs of Melbourne. Her most recent position was as F-3 Mathematics Leader at Lumen Christi Catholic Primary School in Point Cook. This role allowed her to strengthen her links with the Mathematical Association of Victoria (MAV) and eventually led her school to be recognised as a Maths Active School (MAS). This partnership also gave Cassandra the opportunity to present at the MAV Annual Conference and write an article for MAV’s newsletter, Common Denominator. Cassandra is a passionate Carlton supporter who can often be found checking out the latest restaurants and bars that Melbourne has to offer. She has one son, currently completing Year 12, who is hoping to study economics at university next year.